Woodhaven (currently a low secure hospital for adults with a learning disability) will be redesigned to become an adolescent low secure hospital. This will provide up to 14 beds primarily for young people from the south of the country. The interim low secure ward, currently located in Bluebird House (also in Calmore on the Tatchbury Mount site), will transfer over to the new low secure hospital when it is ready. To accommodate the patients currently being supported at Woodhaven, we plan to build a brand new bespoke 10 bedded low secure forensic residential unit on the main Tatchbury Mount site. To make use of current resources this replaces Rufus Lodge, currently a unused clinical building onsite. Please find a full briefing of our proposed plans attached. 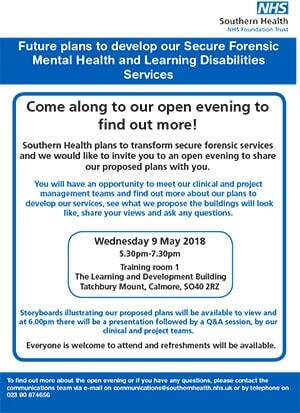 We would like to invite you to an open evening to meet our clinical and project management team and find out more about our plans to develop our forensic low secure services, have an opportunity to see what we propose the buildings will look like, share your views and ask any questions. Everyone is welcome to attend and refreshments will be available. If you are unable to attend the open evening, have any questions or would like to discuss these proposed plans further then please contact us via Email or via telephone on 023 80 874656.